The Toy Chronicle & Toy Think Tank are SUPER pumped to announce that we will be hosting the Superplastic Janky Series One London Launch Event! To celebrate the launch of the Janky Series One, The Toy Chronicle & Toy Think Tank will be returning to the old haunts of Bethnal Green (where ToyConUK resides), where we shall be hosting a SUPER awesome signing session on Saturday 15th December with none other than Janky Series One artists Pete Fowler & mcbess!!! An absolutely great coup for the UK Designer Toy scene! You don’t want to miss this one! 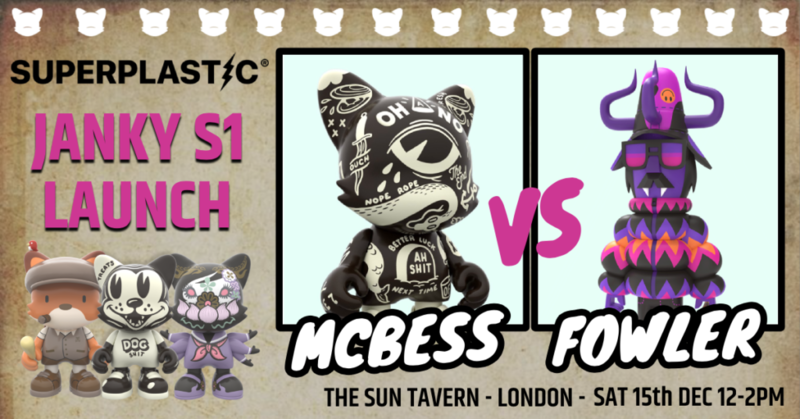 We have been working with Superplastic over the past few months arranging this special event for Superplastic fans to convene for the first time, and we are incredibly happy that mcbess and Pete Fowler will be in attendance. If you backed the hugely successful Superplastic Kickstarter earlier this year (read HERE) you SHOULD receive your packages over the next two weeks or so, hopefully in time for the Janky Series One Launch Event on 15/12. Perhaps you purchased an extra Max Ca$h by Pete Fowler or a Blackout Super Janky by mcbess and want to get them scribed by the appropriate artists! Now is the time, bay bay! We will also have a limited number of the Blackout 8inch Super Janky by mcbess (£60) and the Max Ca$h 10inch Gothic Sunset by Pete Fowler (£70) available to purchase on the 15th, so you can get these personally signed by the artists! SUPER limited numbers. If you wish to pre-order yours, to guarantee that it’ll be there on Saturday 15th, we have set-up a page for them HERE. We will have a limited number of Janky Series One Blind Boxes available too for purchase for £5 a box. With no added shipping & no long delivery dates, this is the perfect time to get your mitts on these beautiful new Designer Toys there & then in London! You should bring along your Janky duplicates (if any) to trade with your fellow Superplastic fans on the day! Tag any photos from the day with #superplastic and #superplasticLondon so that Superplastic can share these globally with the rest of the Superplastic community! We will be hosting the Superplastic Janky Series One London Launch at The Sun Tavern in Bethnal Green from 12-2pm (441 Bethnal Green Road, E2 0AN). This will be the period where you can get shizzle signed by mcbess and/or Pete Fowler. If you turn up at 12pm we will have free drinks and a special gift for you. These are based on first come first served basis. See the TTC Beard (Gary) in his The Toy Chronicle Five Year t-shirt for information. If shipping from the US all goes to plan, you’ll also receive a raffle ticket which will be drawn at 2pm to win an extra special prize. One that most will be very jealous! After 2pm, we will continue drinking during the Saturday. If you can’t make the original signing session, please come join us for a drink after 2pm. It’s super close to Bethnal Green London Tube Station, as you can see on the map below. We also have a Facebook Event Page for this great day HERE. If you’re not in London on 15/12, keep your eye out for other Superplastic Launch events taking place worldwide! There are several taking place. We are hearing San Francisco, Philadelphia and Toronto! You need to follow Superplastic on Instagram HERE for more details. We’ll keep our eyes to the floor for more details when they become known.